Earn your Master’s the wild way! Woodland Park Zoo is pleased to offer the Advanced Inquiry Program (AIP), an exciting web-based master’s degree program from Miami University with experiential learning and field study with the zoo. The AIP is designed for a broad range of professionals from education, conservation, business, community organizing, and government settings, and the program offers a groundbreaking graduate degree focused on inquiry-driven learning as a powerful agent for social and ecological change. AIP students are able to share ideas with peers and faculty nationally, while also working directly through their AIP Master Institution to improve local communities through shared investigation and action. The AIP enables students to join an unprecedented national network of leading institutions committed to social and ecological change. Students learn to use inquiry not only as a method for integrated learning, but as a basic tool for co-creating a better and more sustainable future. AIP master's students practice the skills of investigation, critical reflection, leadership, and collaboration required to effectively address the vital issues of our time. Applications accepted until February 28 for summer enrollment. Want to learn more about this exciting opportunity? Attend an informational forum about the Advanced Inquiry Program! Join other prospective students from around Puget Sound to learn more about this Master’s degree opportunity. There are currently no informational forums scheduled at this time. 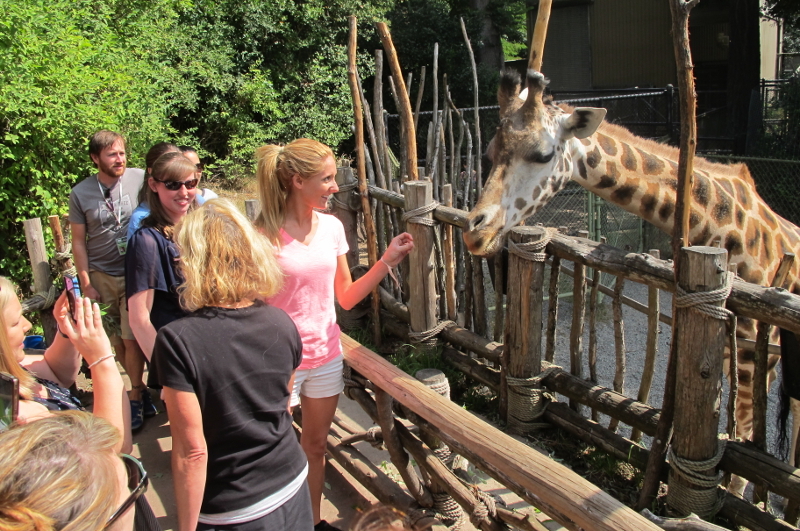 The zoo as a window to your world of learning: AIP master’s students earn 35 total credit hours: 21 credit hours of AIP W+ courses that combine web-based instruction with experiential learning on-site at Woodland Park Zoo plus 14 credit hours of AIP Core Courses that occur on the web. Up to 7 credit hours from an Earth Expeditions global field course may count toward the degree. Convenient and flexible: Can be completed in 2.5 to 5 years part-time while working! Relevant: Program courses and projects integrate Washington State Science Learning Standards for inquiry-based science learning, best practices in informal science and conservation education, and participatory education as a tool to engage all communities in the creation of a more sustainable future. As one of eight national Master Institutions for the AIP, Woodland Park Zoo is excited to offer unique learning experiences on zoo grounds, in natural settings around Washington, and at field conservation sites around the world. Based in Woodland Park Zoo’s significant experience with educator professional development, the AIP provides a strong foundation in ecological literacy, skills in inquiry-based learning and community engagement, and principles of field investigation. Students make local connections, receive individualized mentoring, and share their work at the zoo and in their community. Students also join fellow students, AIP faculty, and leaders across the U.S. in web-based learning communities for collaborative research and national inquiry projects. Enrollment is open to applicants with a bachelor’s degree regardless of academic major or profession. The AIP is designed for a variety of working professionals and individuals interested in advancing their careers in education and conservation, and can be completed in 2.5 to 5 years taking classes part-time while working. 21 credit hours of AIP W+ courses that combine web-based instruction with experiential learning on-site at Woodland Park Zoo plus 14 credit hours of AIP Core Courses that occur on the web. Up to 7 credit hours from an Earth Expeditions global field course (www.earthexpeditions.org) may count toward the degree. For information on estimated program costs, please visit Project Dragonfly's Estimated Costs page. Applicants elect to enroll in either a Master of Arts in Teaching (MAT) degree in the Biological Sciences or a Master of Arts (MA) degree in Biology (see Project Dragonfly’s program details). MA and MAT candidates go through the Advanced Inquiry Program together. Approved for Certification or Endorsements? This program is not intended to lead to educator certification. Educators are advised to contact their individual school districts as to whether this program may qualify for salary advancement. Prospective Washington State students are also advised to contact the Office of the Superintendent of Public Instruction at 360.725.6275 or pesb@k12.wa.us to determine whether this education program is approved for endorsements in Washington State. Miami University is authorized by the Washington Student Achievement Council and meets the requirements and minimum educational standards established for degree-granting institutions under the Degree-Granting Institutions Act. This authorization is subject to periodic review and authorizes Miami University to offer specific degree programs. The Council may be contacted for a list of currently authorized programs. Authorization by the Council does not carry with it an endorsement by the Council. Any person desiring information about the requirements of the act or the applicability of those requirements to the institution may contact the Council at P.O. Box 43430, Olympia, WA 98504-3430. Co-delivered by faculty at Miami University and Woodland Park Zoo professional education staff, the AIP combines graduate courses at the zoo with web-based learning communities that connect you to a broad network of professionals from education, conservation, business, and government settings. Project Dragonfly reaches millions of people each year through inquiry-driven learning media, public exhibits, graduate programs, and conservation partnerships worldwide. AIP master’s students join a growing alliance of education, environmental, and community leaders. The AIP is a first-of-its-kind graduate degree co-delivered by major community institutions committed to local, national, and global change. Accepted until February 28 for summer enrollment. If you cannot find the answers to your questions or need additional help please call 206.548.2579 or email aip@zoo.org.